I hope this makes someone laugh. I didn't get to the "Chades Challenge" therefore I lost this week. I finished this piece because it was related to work. 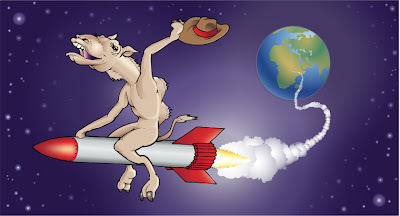 What a crack up a camel riding a rocket! Great job! Very funny ilustration. Incredible non-sense... Congratulations!!! How funny illo! The expression of the camel is so nice! In my mind, this camel is shouting in the voice of Slim Pickens! Can I use this image in my blog post related to Camels? It does not need to be big or black.